This is an adaptation of a recipe created by Carol Fenster, the author of Cooking Free, which I highly recommend – I’ve never had one of her recipes fail, no matter how much I adapt it! This recipe serves our pizza-loving family of 5-6 without leftovers. If you have a smaller family (or people who aren’t as pizza-loving), freeze the extra crusts after the first baking period, and keep them for when you want a quick pizza and don’t have time to make it from scratch. 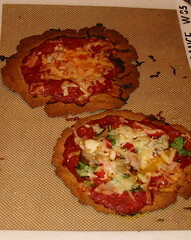 My gluten-eating friends and family say that this gluten free, egg free, dairy free recipe beats many pizzaria crusts. This is a delicious gfcf, gluten free, family-friendly recipe! It is also (if you double check ingredients!) a wheat free, dairy free, soy free, egg free, tree nut free, peanut free, fish free, shellfish free, corn free, top 8 allergen free, and South Beach phase 2 safe recipe. This recipe can be easily made vegan/vegetarian by switching the gelatin for agar agar. Preheat oven to 425F. Line a baking sheet with parchment paper or silpat. Add the olive oil and vinegar to the water/milk combo. Pour the liquid into the flour mixture. Beat on medium speed for a couple minutes, until it forms a big ball. At this point, decide if you are making 1 very large pizza or several small pizzas. 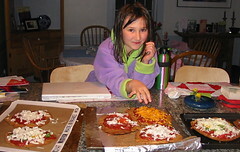 Plop the dough onto the lined baking sheet(s), and use your fingers to stretch it out. The dough is sticky, so either use some extra flour to coat your hands, or wet your hands so the dough won’t stick to them. Press and stretch until the dough is thin and shaped as desired (we usually make individual-sized pizzas, or a few individual and one larger one). Bake WITHOUT TOPPINGS for 20 minutes. Return to the oven and bake for another 10 minutes until bubbly and hot. Slice and eat – yum! The U.S. Bureau of Alcohol, Tobacco and Firearms formerly recognized 16 bottle sizes for domestic American wine and 27 sizes for imports….